Dr Montessori believed that the goal of children is to ‘aim energetically and directly towards independence’. 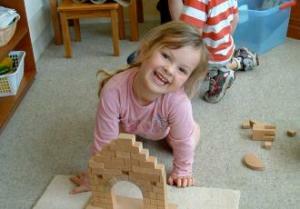 The Montessori method of education is suitable for all children. It is highly individualised with clear guidelines. Children are all different, with their own learning styles and temperaments. In the Montessori classroom they are free to move about and explore the environment because with activity and movement comes learning. Movement, in fact, contributes not only to the physical but also to the intellectual development of the child. Therefore children are not expected to sit still and listen to a teacher telling them what to do. When people visit a Montessori school, they often comment on how quiet the environment is compared with many other early childhood centres. It is true, the Montessori classroom is less noisy and boisterous, however it is because children are busy and active in a calm way. Whilst noise levels are kept low to allow concentration, children are given the skills to achieve this through Grace and Courtesy lessons. They are shown how to speak quietly with each other, to walk up to a teacher when they need assistance instead of yelling across the room, etc. They are taught the skills of volume control as part of the emphasis on respecting each other and the work everyone is doing. Teachers in the Montessori environment focus on each child as an individual, inviting them to think for themselves, ask questions, explore, investigate and discover. Their role is to act as a guide, providing activities that engage them, capture their attention and spark their interests. Through careful observation the teachers are able to provide an environment that meets the needs of all children, therefore eliminating the need for external discipline or control. It is a place where children can do things for themselves. They make independent choices and interact with the materials for as long as they want to, which results in focusing their attention. Many of the activities are designed to draw children’s attention by their colour, size, shape, or way in which they are presented, so gradually children learn to pay attention and focus on their self-chosen tasks, they discover how to learn.